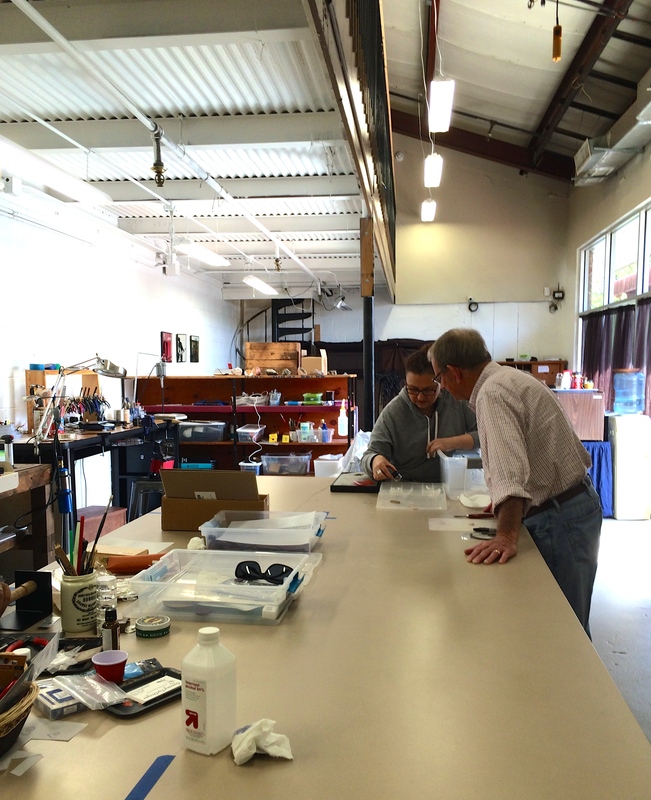 Art DeTour 2015 at White Fox Beads and Davis Studio | Oh, the Places We See . . . The beauty of following the Art DeTour signs during Knoxville’s Dogwood Arts Festival is that you never know what you’ll see next. Or who you’ll meet. Or what you’ll learn. And that’s the joy of the hunt for us. First stop after seeing the work of Melanie Wood (Click here for post on that visit), we followed the sign into The Studio at White Fox Beads. Owner Gail DeLuca proudly toured us through the large open studio on Homberg Drive where artists frequently gather, work, and collaborate — or seek advice as needed. It was a place for advanced beading (if there is such a term), evidenced by the quality of work on display. Inside The Studio at White Fox Beads, Gail DeLuca shows Bert some of the materials she uses to create her one-of-a-kind jewelry pieces. 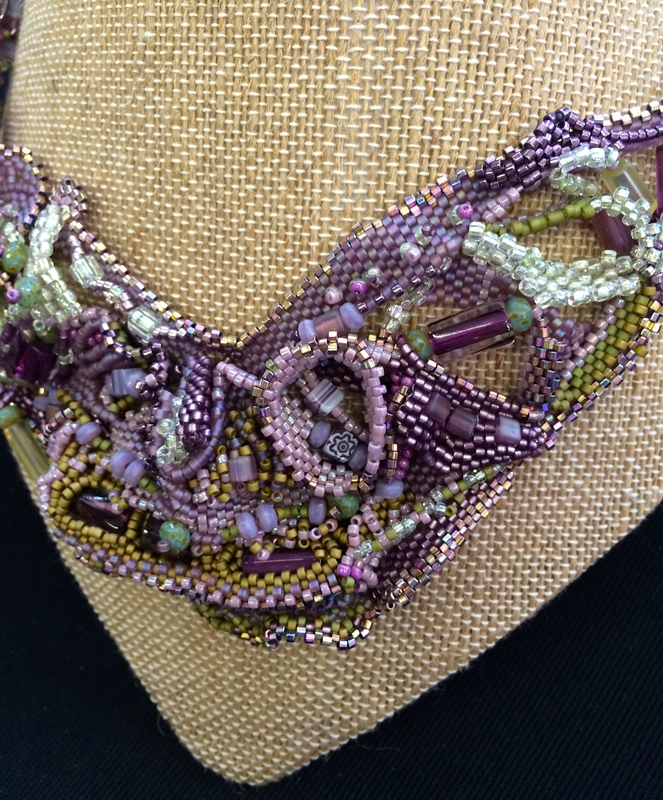 Once you see finished products like this intricate necklace, you understand the quality of this art — and know that this is not where beginners begin. 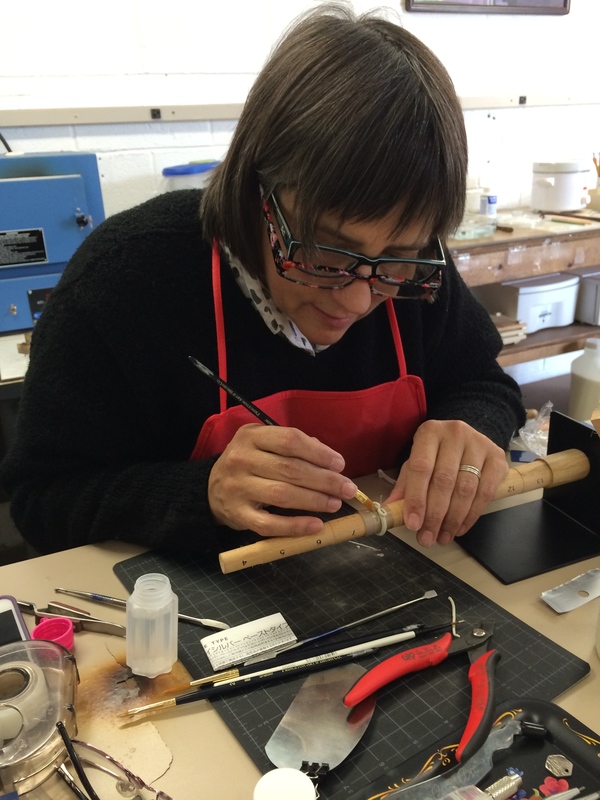 Focused on shaping a silver ring, Judi Talley shares her craft while continuously working. 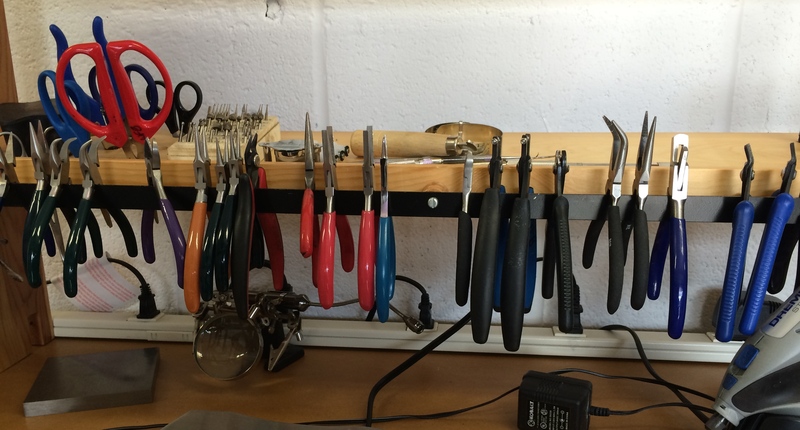 A quick look around assured us that this was no place for novices, but you wouldn’t know it from the welcoming and genuinely helpful comments by both jewelry enthusiasts. We felt comfortable there. And we left with the feeling that if you wanted support with gemstones, metal, found objects, or glass beads, you’d find it here. Around the corner, Shannon Davis opened the doors to Davis Studio, a place we’ve passed hundreds of times but had never visited. According to the Dogwood Arts brochure, three women contribute to the art sold at the studio: Shannon Davis and Cynthia Tipton specialize in oil and watercolor, and Cindy Marshall does off-loom, beadwoven jewelry. 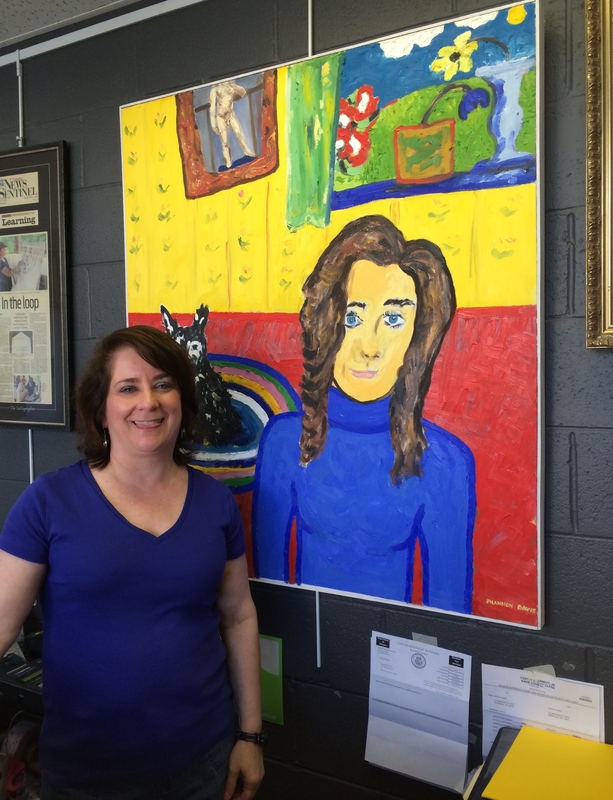 Shannon Davis poses in front of her colorful self-portrait. In addition to showcasing the art of these three artists, Davis Studio represents numerous other area artists (listed on the website). Other services include calligraphy, custom framing, and art classes for adults and children. 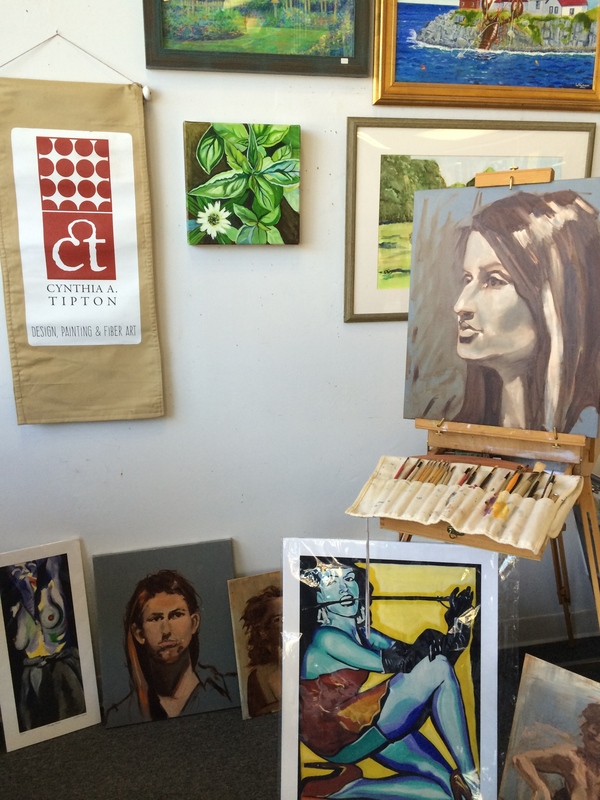 Work of Cynthia Tipton and others on display at Davis Studio, Knoxville. 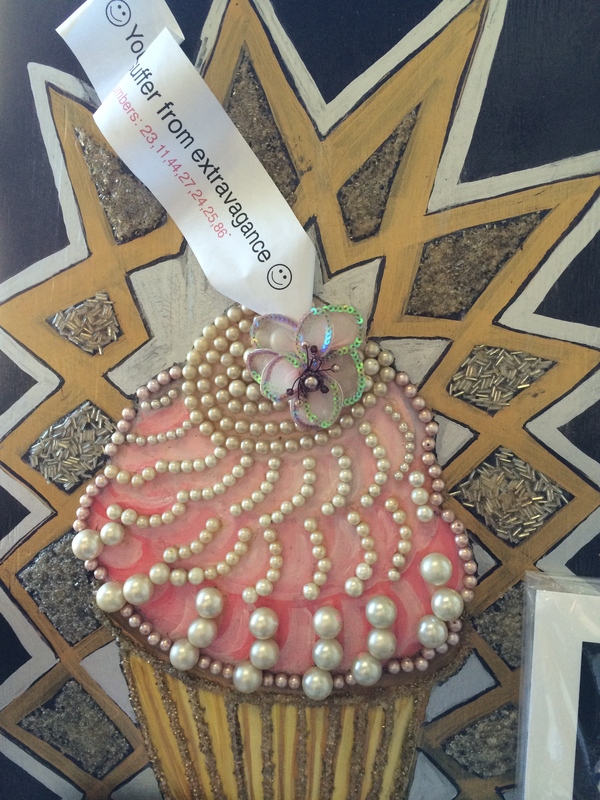 Cynthia Tipton‘s beaded cupcake design (now reproduced on cards) brought out her humor as she added this tidbit onto the paper strip inserted at the top: You will suffer from extravagance. Cynthia Tipton’s beaded cupcake design — available on cards at Davis Studio. 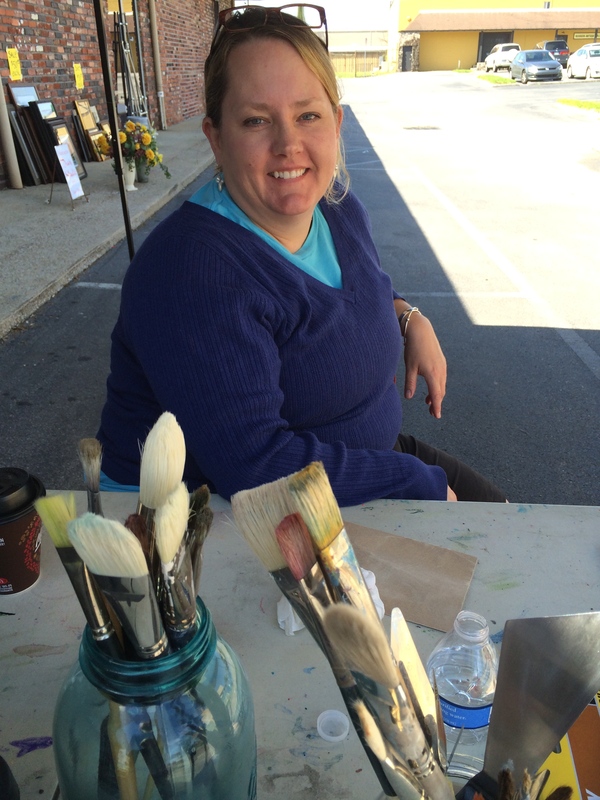 When we left Davis Studio, Cynthia Tipton had taken a seat under the tent where she would eventually demonstrate her craft for festival goers. I’m waiting for a friend to deliver a five-foot canvas that I’m going to work on today, she said. Too bad we couldn’t get back to catch that action! Cynthia Tipton waits for a five-foot canvas under the tent where she’ll demonstrate her craft. For more information on these two studios and the classes they offer, check out the locations and websites below. 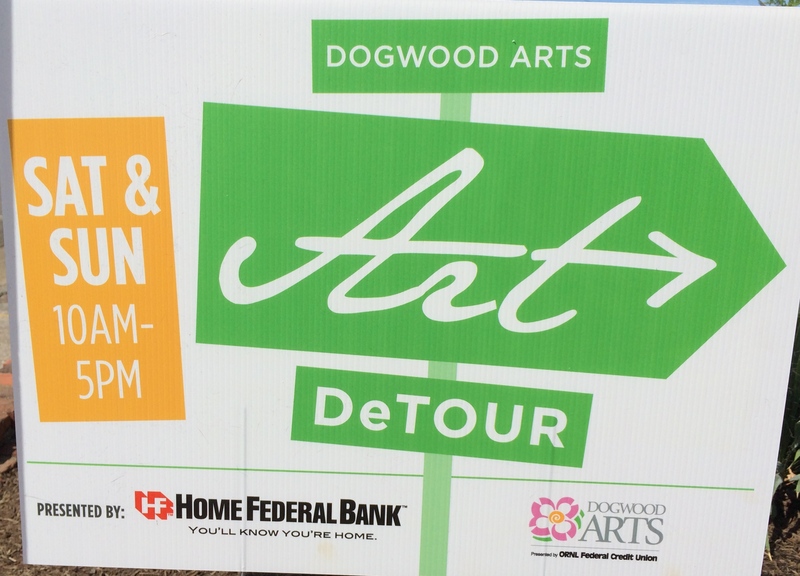 For more information on Dogwood Art DeTour, click here. For all the posts on Dogwood Arts Festival 2015, click here. This entry was posted in Travel and tagged beaded jewelry, Cindy Marshall, Cynthia Tipton, Davis Studio, Dogwood Art DeTour 2015, Dogwood Arts Festival 2015, Judi Talley, Shannon Davis, silver jewelry, White Fox Beads. Bookmark the permalink. You’re quite welcome. And we’re not through yet!!! So many places, so little time. But I’ll get to the last two in a day or two. Thanks, as always, for taking a look. You are right on both statements. This beautiful art does take time. I was amazed at the beadwork — no patience for that sort of thing!!! Thanks for taking a look.